nTech provide innovative software and services, all of which are optimised for fast production deployment. Working with companies of all sizes, nTech offer bespoke solutions that enable their customers to quickly become productive and realise measurable returns. As a user of the Textlocal API integration, nTech gave us an overview of how easy and time efficient the set up can be. Was it relatively easy and quick to integrate with the Textlocal API? Do you have an idea of how long the process took? I’d already written what’s known as an interface for the sending of text messages. This had a number of empty methods in it that any successful choice would have to use. I found that Textlocal was the easiest one to get to conform to this interface. 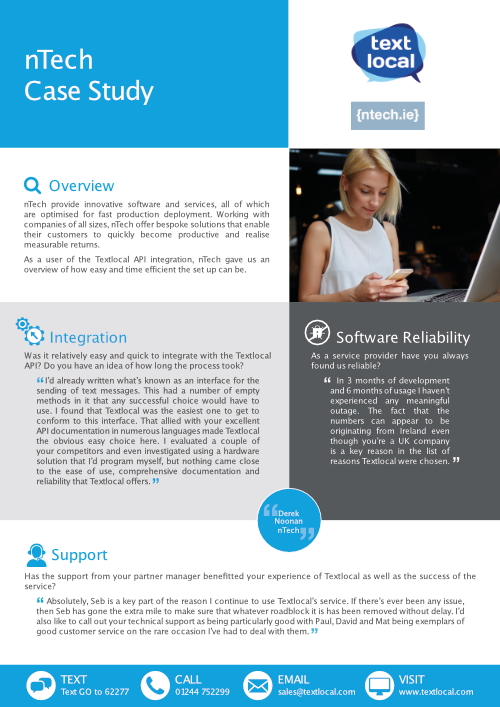 That allied with your excellent API documentation in numerous languages made Textlocal the obvious easy choice here. I evaluated a couple of your competitors and even investigated using a hardware solution that I’d program myself, but nothing came close to the ease of use, comprehensive documentation and reliability that Textlocal offers. As a service provider have you always found us reliable? In 3 months of development and 6 months of usage, I haven’t experienced any meaningful outage. The fact that the numbers can appear to be originating from Ireland even though you’re a UK company is a key reason in the list of reasons Textlocal were chosen. Has the support from your partner manager benefitted your experience of Textlocal as well as the success of the service? Absolutely, Seb is a key part of the reason I continue to use Textlocal’s service. If there’s ever been any issue, then Seb has gone the extra mile to make sure that whatever roadblock it is has been removed without delay. I’d also like to call out your technical support as being particularly good with Paul, David and Mat being exemplars of good customer service on the rare occasion I’ve had to deal with them.